One rope threads through two pulleys to propel the acrobats onto the stage – and into the air – in this dynamic circus performance. This single rope opens the full 360 degrees of possibility. It becomes a seesaw, a swing and a set of scales to launch, catch and cradle the seven performers. Melbourne-based One Fell Swoop Circus create a space of physical forces that can be played with and defied – something the troupe use to great effect. 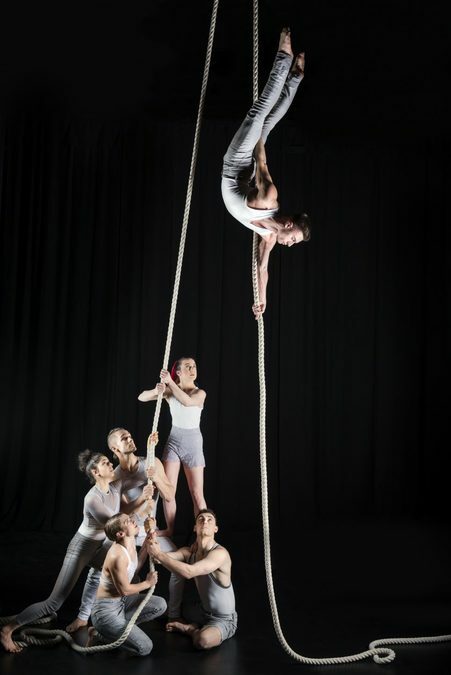 The rope transmits momentum into each body and is brought to life by the fast-paced and propulsive acrobatics. A particular highlight is the competitive and charismatic Sarah Berrell who adds emotional depth. But, she is the exception. As technically accomplished as the show is, at times it can feel more like sitting through a recital. For instance, the acrobats don't always hold their poses long enough to play to the audience. And so despite its momentum and impressive feats, By a Thread doesn't quite leave the lasting impression it should.